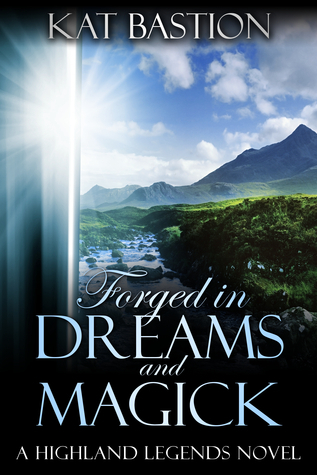 Thanks to AToMR Tours, we're spotlighting a brand new time travel/paranormal romance, Forged in Dreams and Magick, by Kat Bastion. Keep scrolling to check out a guest post from the author and then enter to win a copy for yourself! Kat lives with her husband amid the beautiful Sonoran Desert of Arizona. 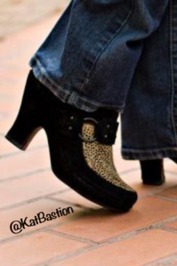 Visit her blog at www.talktotheshoe.com, her website at www.katbastion.com, Facebook at https://www.facebook.com/pages/Kat-Bastion/382546338470769 , and her Twitter account at https://twitter.com/KatBastion for more information. “May all who seek refuge, find it. When you find comfort from another, cherish it. Should you be graced with true love, embrace it.” ~ This favorite quote is a portion of Iain’s toast at the Beltane celebration. Not only is it a wonderful philosophy for their clan, but it serves as a creed for us all to offer and value the important things in life. “Woman, I would travel to the ends of the Earth to bring that smile to your face.” ~ Iain. Regarding a surprise both mundane and extraordinary, the scope of his statement expresses the depth of his love. He put his hand on the side of my head, smoothing my hair. Gentle lips kissed my forehead. “Sometimes our emotions rule us. How we handle the consequences . . . defines us.” ~ Velloc praises Isobel in a way that encompasses kindness, forgiveness, and grace, but its profound meaning applies to everyone. “A deep ache burned in my heart. My head spun. Panic had set in, and I didn’t want to leave. Conflicting emotions threatened to overrule any sense of purpose I’d had since my entire odyssey began. To a wanderer of worlds, knowledge might’ve been power, but human connections had become everything.” ~ I love this poignant moment when Isobel realizes her purpose is no longer about the historical adventure, but those she loves along the way. “Markers in my journey, every guidepost had simply showed me the way. I went down the path, choosing right or left at forks in the road, but the doorways did not define me. My actions every step of the way determined my course, revealing the person that existed inside.” ~ Isobel accepts the strength she’s discovered inside and commands her destiny, the warrior within her rising to the challenge, no matter her uncontrollable circumstance. The sentiment is great inspiration. Want to know more? We've got a couple of giveaways running: the author is giving away 5 signed paperback copies of the book, 5 ebook copies, and one charm bracelet. And then, if you want an even greater chance to win the book, enter the second giveaway, exclusive to The Best Books Ever, for an ebook copy, to be delivered via Amazon/B&N/Smashwords. Both giveaways are international, so enter at will! Thank you for sharing some of my favorite quotes, Sarah and The Best Books Ever! Hello, Erin, Anca and Diana, thank you. Good luck to everyone on the giveaway. wow this story looks amazing! i love scottish stories but the thing that pulled me in the most were the quotes from the story. “Sometimes our emotions rule us. How we handle the consequences . . . defines us.” doesn't that strike a cord in us all. thx for the giveaway. hope i get to win one.